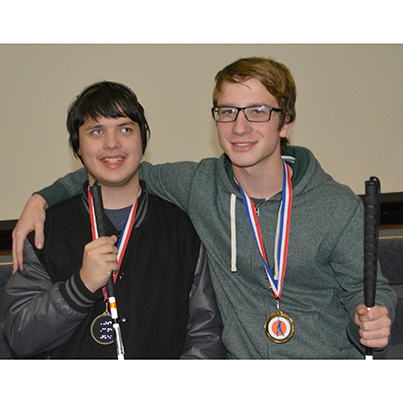 Students from across the state competed at Oklahoma School for the Blind’s Oklahoma Regional Cane Quest competition in Muskogee: (from left) Sophomore Nathan England from Jenks and Freshman Avery Carrington from Tulsa. MUSKOGEE, Okla. – Thirty Oklahoma students competed for awards at the sixth Oklahoma Regional Cane Quest competition hosted recently in Muskogee by the Oklahoma School for the Blind. OSB invited certified orientation and mobility specials and certified teachers of the visually impaired to score each student’s orientation and mobility skills. The students earned the same medals in the Top Scouts category. In addition to OSB, Regional Cane Quest sponsors include the Braille Institute of America, OG&#, Frank Dirksen, NANOPAC, Inc., NewView Oklahoma, LS&S, Sapulpa Lions Club, Ruth Kelly Studios, Oklahoma Association for the Education and Rehabilitation of the Blind and Visually Impaired and Muskogee County Oklahoma Home and Community Education. Cane Quest is a national program of the Braille Institute of America, based in Los Angeles, California. The academic program for OSB residential and commuter students meets all state-mandated education requirements. Students also receive specialized instruction in Braille, orientation and mobility and other areas. They attend classes Monday through Thursday free of charge and are transported home for three-day weekends during the regular school year. OSB staff also assist students with vision impairments who attend other public schools, their families and educators. For more information about OSB, phone toll free 877-229-7136. Also, visit http://osb.k12.ok.us/ or www.okdrs.gov.